Its no secret i love Indies, and i love finding new ones, and love it when a British one pops up! And i have tried a few of Tara's and shes such a great polish maker and a fab girl to top it off! A little bit of info on Tara's Talons, if you haven't already discovered this brilliant girl and her polishes (and if you haven't, where have you been!!??!! ), this should bring you up to speed! TarasTalons nail polish launched on the 1st of April 2013 with a collection of ten 10ml polishes. There were ten of each of these polishes, however all other collections have been one off polishes! What Tara is doing now is 5ml bottles of these one off polishes that will be sold singly as well as in pairs or collections. Currently in the Etsy shop are things like Pick’n’mix bags, Lucky bags and a Talon twosome. Tara will also be doing these and her custom polishes in the 5ml size as well! The 10ml bottles are £6.50 each and custom 10ml polishes are £8.50. The lucky bags are four random polishes which costs £14.40, the Pick’n’mix bags are four polishes of your choice for £20.00 and the Talon twosome is two polishes of your choice for £11.00. The 5ml polishes will be £3.50 each and the custom ones will be £5.50. Collections of two polishes will be £6.50, collections of three polishes will be £9.50, collections of four polishes will be £12.50. Lucky bags of four random polishes will be £10.00 and Pick’n’mix bags of four polishes of your choice will be £13.60. 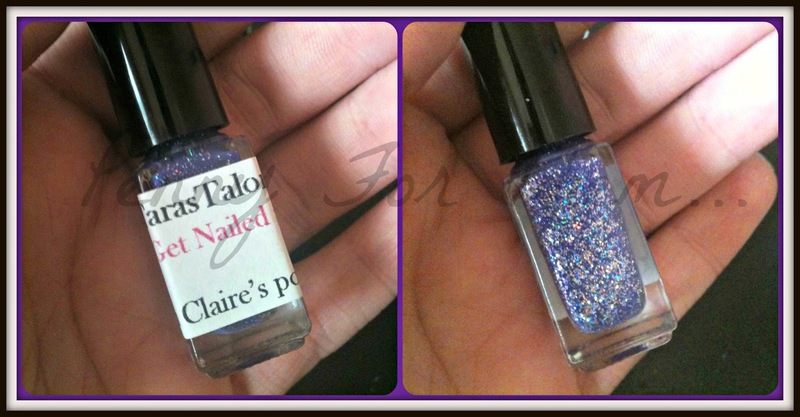 The 5ml Talon twosome, which is two polishes of your choice will be £6. So, because I'm a very lucky girl Tara kindly sent me 2 of her new 5ml bottles.....which i loved as soon as i opened the package up..their names are what caught my eye straight after the colour...how could i NOT love polishes that are so personal! 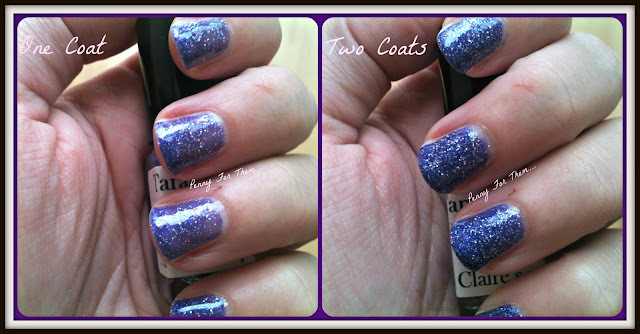 The first was simply called "I Am Claire's Polish" and i have to say this one is completely my favourite, but then I'm a total purple- aholic!! This only needed 2 coats, a nice thick polish that actually was OK with one coat, but the second coat added the total coverage. 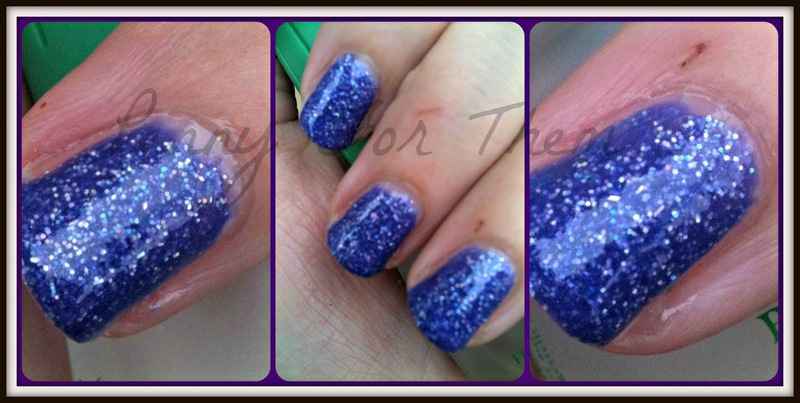 I LOVE the colour - a beautiful true purple with oodles of sprinkles of holographic glitter. LOVE IT!! And so close to saying "Tara, i need a big bottle of this!!!". See when i say even one coat was enough, but the second coat just added the finishing touch! The top coat was a generous coat of Gelous, which i think made it look even better! It looks a blue in the pictures but trust me when i say its very much a purple!! 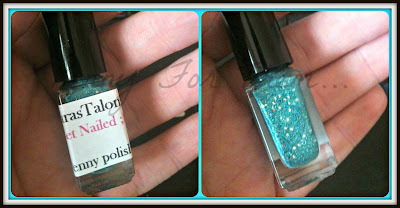 Next little bottle in my hand was a gorgeous turquoise/green that Tara had named after my blog and called "Penny's Polish". I love the names of these two, i feel all kind of special to have my names on the bottles!! (is that kinda sad!!??). 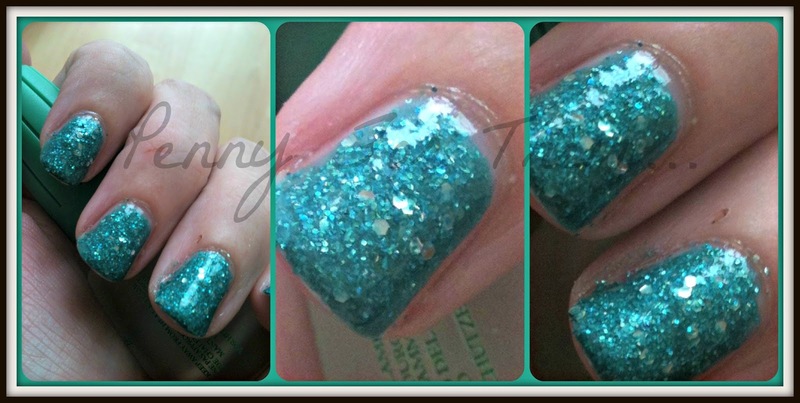 This was a gorgeous light green with a touch of turquoise and silver glitter running through it. A thick polish again, so only 2 coats needed to get full coverage again. This one id say is almost a texture polish which i think you can just make out. 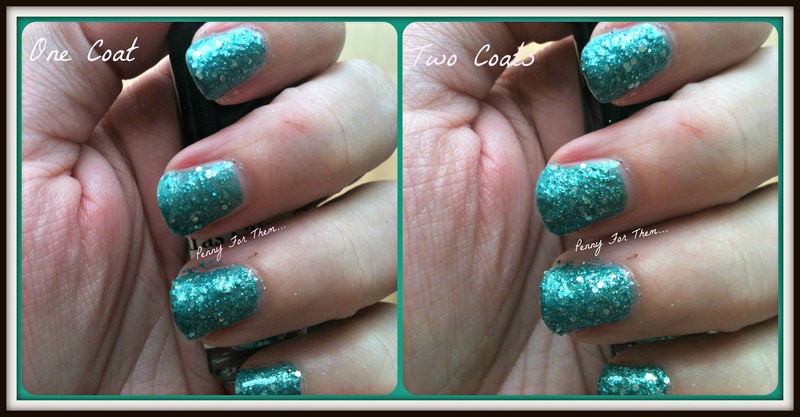 The top coat i used was a thick coat of Gelous and made it very smooth, and uber shiny!! You can see the smoothness now with the topcoat and also the extra glossy look it gives. These are not my first Tara polishes, and i KNOW they wont be my last. Tara does all her polishes by hand, alot of them one offs which makes you feel a little special that you have a polish that no one else in the world has! Tara is a brilliant girl to chat to, a total polish lover too. She has these great false nails that shes decorated on her Etsy store and its something I'm meaning to try out as they look great! The Etsy store has recently been restocked so is jam packed with nail goodies that you should check out before all are bought!! Happy Polishing guys, i hope you treat your polishes as well as they treat you - with total sparkle and hug your nails!! !